What do you do after you’ve gambled your house away, wandered the streets admiring the glitz, questioned why anyone would think you would want a girl to your room in twenty minutes when you’re with your wife and kids, and seen every song the Bellagio fountains can play? You might try leaving the Strip and seeing what lies beyond the city limits. The deserts around Las Vegas offer a variety of activities including quad-biking, hiking and land sailing. 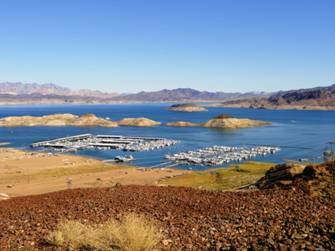 A more sedate option worth considering is the bike tour to Hoover Dam. Riding a bike in the desert, you say? Well, maybe not in the middle of summer but quite OK the rest of the year. Sedate? How? Because this ride is mostly downhill. The bike tour to Hoover Dam begins with a convenient pick-up at your Las Vegas hotel. You are chauffeured to a bike shop in neighboring Boulder City where you choose your bike, have a helmet fitted and begin the ride. The only true uphill section of the tour is leaving the shop to reach the start of the special bike trail you will be riding on for the first half of the journey. The track begins in the red and orange desert hills. Soon you have descended to street level where the bike trail becomes the storm water drain — no doubt more animating when it rains, which doesn’t happen often so it’s not likely to interfere with the ride. This is a fast section of the trail and the sloped sides of the drain allow for some stunt riding if you feel inclined (pardon the pun). The first stop is at the end of the drain, a slight detour to a park oasis of tall trees and green grass overlooking Lake Mead in the distance. Here Bighorn sheep come to graze. The tour continues back into the hills where you pass big mansions built against the rock walls, one with a giant waterfall feature that flows above and behind the house — not what you would expect to see in the desert. But this is Las Vegas and anything is possible. The last section of the bike track is a long downhill slope where you can r eally pick up some speed as you fly to the causeway at the bottom. Soon after that the paved trail ends and the dirt track begins. Most of the way from here to the dam is along the old train track that was built to carry men and concrete during the dam’s construction. The rail line is gone but the gentle gradient trail remains. 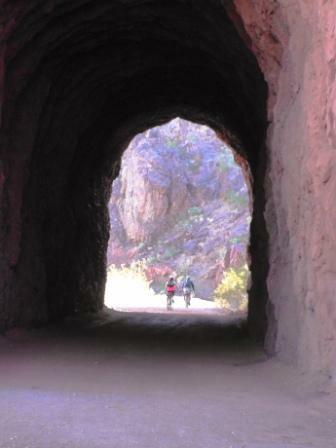 In this section you pass through five old tunnels, with Lake Mead and the marina on your left and small red-purple valleys on your right. The riding is slower here, so you have more time to appreciate the views and enjoy the tunnels. Near the end you veer away from the old rail track and wind down a few more hills to the top of the dam parking area. As you move closer to the dam, the number of power lines everywhere increases. Hoover generates a massive amount of hydro-electricity, very necessary to keep the lights of Vegas shining brightly. The bike ride is over. You are sent with a packed lunch to spend some time on the dam wall and take photos, including some shots of the newly-constructed multi-billion-dollar bypass bridge built downstream for through traffic above the dam. When you’re ready, you return to the waiting guide for the drive back to your hotel. 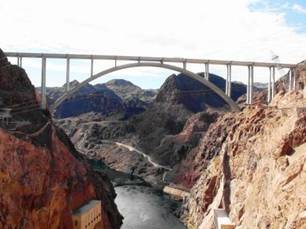 This is a wonderful and different way to visit Hoover Dam and a very engaging excursion away from the hustle and bustle of the Strip. The Hoover Dam Bike Tour can be booked online at www.alllasvegastours.com for $160 per person. The best hotel in Vegas has to be Wynn Encore. Magnificent spacious rooms are available from $200 per night. While at Wynn, a must-see is their show Le Reve — what you’d expect from a Cirque all set in water, it’s truly breath-taking (tickets from $99). See www.wynnlasvegas.com for details. If you want the best massage on the Strip, without having to pay a year’s salary, check out the Destination Salon at the Sahara.